The Cathedral Prep and Villa Maria Academy theater program is putting on a spring festival to round off this year’s plays. 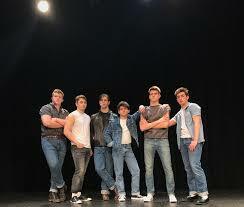 The story is about a group of friends or “greasers” and their lives. They often have fights with the “Socs,” who are the rich snobby kids at the time. The story takes place back in the late 50s/early 60s. The two main characters get themselves into some trouble and have to run away. Then they end up being heroes and coming back home. This show has a stellar cast, which includes star Dillon Elliott as Ponyboy. This is Dillon’s first play, but he is sure to show that he is ready to fulfill his role. Ponyboy is the youngest of the group and also very shy. He loves books and movies. He hates the whole Greaser/Soc rivalry. Johnny, who is played by Lucian Cuzzola, is Ponyboy’s best friend. He is 16 years old and a very shy kid as well. He is often abused at home and even gets the worst of it from the rich snobs. He is very jumpy and scared. This is Lucian’s first play as well, and he is sure to not disappoint with this role. Two Bit, played by Trey Deitrick, is the jokester of the show. He is often not taken seriously and is known to put his two cents into everything, hence the name Two Bit. This is Trey’s 4th show here at Prep, and he is very excited for this role. Darry, played by Nicholas Carneval, is the oldest of the group. He has taken the role as the dad of the family after his parents died. He yells at Pony a lot and Pony does not like that. Carneval stole the show in Footloose and will play this role very well. SodaPop, who is Pony and Darry’s brother, is played by Alex Welz. He is soft spoken, a dropout, and Pony’s favorite brother. Then there is Dallas, who is the bad guy of the group. This character is played by Garrett Fritz and is sure to be interesting. He is known to get into trouble a lot and is the big guy on campus. Everyone respects him. This show is sure to be a hit, especially with its director Fr. Mike and his co-director Max Lorei. Come out and see this show, May 19-21.